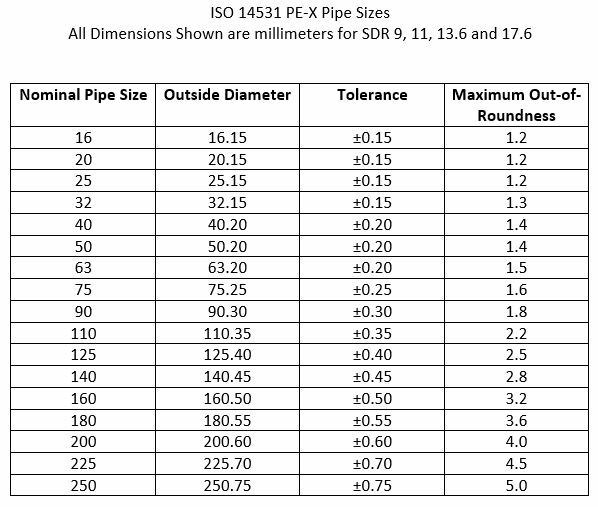 PEX Plastic Pipe Sizes - Bryan Hauger Consulting, Inc. If you're wondering whether or not PEX pipe is safe for drinking water, then please read our PEX pipe safety page for plumbing. Standard PEX tubing dimensions for North America are found on our ASTM F876 page. For FREE DOWNLOAD of a guide includes critical information for design and installation of cross-linked polyethylene (PEX) water supply systems in residential buildings please visit our PPI Useful Links page. A commonly asked question is "What Size Pex Pipe To Use". A useful rule of thumb is that the longer the run, the larger the PEX pipe outside diameter should be. A 16 mm line should be sufficient for lengths up to 80 meters while a 20 mm tube is more appropriate when lengths exceed 100 meters. Please consider Bryan Hauger Consulting as your next PEX pipe or PEX tubing consultant, plastic pipe consultant or PVC pipe consultant. In addition to our expertise in PEX expertise, we provide a multitude of services for plastics professionals including failure analysis of plastic pipe including expert witness and other legal consulting work.